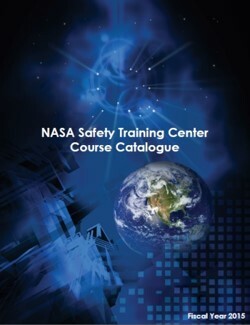 The NASA Safety Training Center (NSTC) at Johnson Space Center was established in May 1991 by the NASA Headquarters Office of Safety and Mission Assurance to provide up-to-date and high-quality NASA-specific safety training on location to NASA centers, or simultaneously to multiple centers through video teleconferencing in the pursuit of the ultimate goal of safe operations for NASA. The NSTC provides safety, as well as, mission success and mission unique training that enables personnel to meet uniform engineering and technical requirements for processes, procedures, practices, and methods that have been endorsed as a standard for NASA programs and projects. With more than 20 years of experience training NASA personnel, the NASA Safety Training Center provides training using standards unique and unobtainable from any other sources, and is now being offered commercially in an effort to share knowledge, expertise, and best practices. The NSTC courses are designed for those involved as test operations team members or engineers who design, plan, and execute hazardous operations, as well as for safety, quality, reliability, and maintenance professionals who may manage, review, design, or oversee such activities. Employees are a company’s most valuable resource. Education and training are investments that protect those resources, enhance on-the-job safety, enable a higher level of mission success, and promote a safe and healthy working environment.